You made it! You are at the top of the heap, a newly minted Manager/Director/VP or CEO – congratulations!! You are now 1-2 actions away from becoming a jerk. As we rise, all the accolades of our once friends, and also our family, quickly pull us back to the middle through rumors, back-channels, or back-stabbing conversations. We don’t like the Crimson Tide, Yankees, or Celtics because they win too much. They try to be better than everybody else. That is also why we pull for Gonzaga, Xavier, and the Cubs – we pull for the underdog, because we don’t want to leave anyone behind – otherwise we look bad, or others think we’re trying to be better than everybody else. To be fair, some of us do – some people who aspire to be CEOs can’t wait to say they think they are better than everybody else. Hollywood would have us believe that the hard-nosed bully bosses, like Jack Donaghy from 30 Rock, these eat-the-weak-for-breakfast-types, are as powerful as ever. Donald Trump maybe powerful and an achiever – but he is not a leader. In title only is he considered a leader. Actually he is a great achiever (self-based) and less a leader (others-based). In our companies, how does this all stack-up? 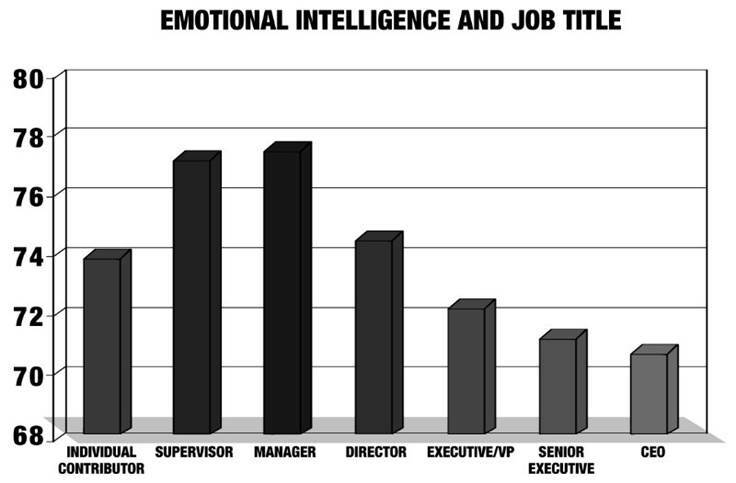 Travis Bradberry recently summarized key findings about EQ by job title from TalentSmart research. Middle managers stand out with the highest EQ scores in the workplace because companies tend to promote people into these positions who are level-headed and good with people. The assumption here is that a manager with a high EQ is someone for whom people will want to work. Things change drastically as you move beyond middle management. Even though CEOs have the lowest EQ scores in the workplace, the best-performing CEOs are those with the highest EQs. You might get promoted with a low EQ, but you won’t outshine your high-EQ competition in your new role. The higher you go above middle management, the more companies focus on metrics to make hiring and promotion decisions. While these short-term, bottom-line indicators are important, it’s shortsighted to make someone a senior leader because of recent monetary achievements. Possibly worse than metrics, companies also promote leaders for their knowledge and tenure, rather than their skill in inspiring others to excel. The more we ruminate on negative thoughts, the more power we give them. Most of our negative thoughts are just that—thoughts, not facts. When you find yourself believing the negative and pessimistic things your inner voice says, it’s time to stop and write them down. Literally stop what you’re doing and write down what you’re thinking. Once you’ve taken a moment to slow down the negative momentum of your thoughts, you will be more rational and clear-headed in evaluating their veracity. The techniques above are extremely effective, but both require an awareness of your own emotions in the moment. The average executive, has as low self-awareness skills. They don’t necessarily “understand how their emotions impact others” and “recognize the role they have played in creating difficult circumstances.” In other words, you would become a much more effective leader if you obtained a better understanding of what you feel, when you feel it. The goal is to slow yourself down and take in all that is in front of you, so that you can understand how your emotions influence your decisions and behavior. During sleep, our brain literally recharges, shuffling through the day’s memories and storing or discarding them (which causes dreams), so that we wake up alert and clear-headed. Self-control, attention, and memory are all reduced when we don’t get enough—or the right kind—of sleep. Sleep deprivation also raises stress hormone levels on its own, even without a stressor present. The pressure that leaders are under often makes us feel as if they don’t have time to sleep, but not taking the time to get a decent night’s sleep is often the one thing keeping us from getting things under control. Best results are from better workers – engage them through engaging ourselves.